In the story mode of FIFA 17, you step into the role of the budding star Alex Hunter. It is up to you to make the young man a football size and bring him out of the small London suburb of Clapham into the wide world. In our guide, we show you what options you have in the story mode of FIFA 17 and who is Alex Hunter. The story mode in FIFA 17 is strongly reminiscent of the NBA 2K16 and its predecessors. It's about a young player, in this case, a football player who is Alex Hunter. The name and the exterior are fixed and you can not change. He is 17 years old and started his career in one of the 20 clubs in the English Premier League. Here you decide which of the choices you like best. You can start with The Journey, it is the official name of the story mode. For those who wonder whether the Bundesliga collection is preserved in the story mode, we can only say: So far no and it is not known that DLCs follow with further content in this direction. 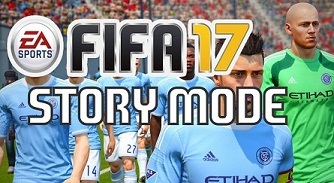 How does the story mode works in FIFA 17? - Personal goals in Story Mode: Produce a hit; reach a duel ratio of at least 60% and others. - Team-based objectives: Complete the game, convince the manager and others. Of course, you will take part in dialogues, in which you have to determine the answers in the story mode of FIFA 17. So there is a playing press conference, in which questions will be asked by the reporter. Here you have a choice of answers. Depending on what you decide, they have an impact on various factors. These include your team, potential employers and the fans. Notional social media platform, you can follow the opinion of the media and your followers.